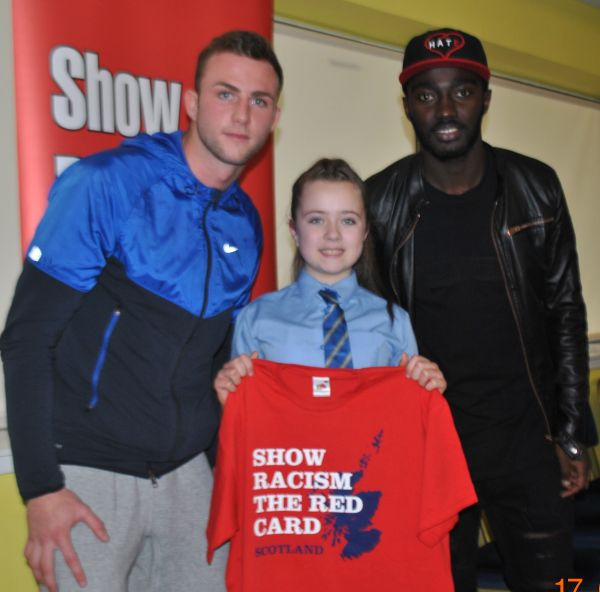 Show Racism the Red Card were delighted to work with Partick Thistle FC to offer an educational event for pupils of Dunard and St Joseph’s Primaries on Monday 17th March. Show Racism the Red Card were delighted to work with Partick Thistle FC to offer an educational event for pupils of Dunard and St Joseph’s Primaries on Monday 17th March. The event, funded by Scottish Government’s Equality Unit saw the pupils come to Firhill Stadium for a day of workshops promoting messages of equality and respect and celebrating diversity. The event culminated with a ‘press conference’ where young people from both schools took on the role of journalist to ask a panel of invited guests and players from the club questions about what they had learned during the day. Guests on the day included first team players, Christie Elliot and Prince Buaben, ex-professionals and Show Racism the Red Card coaches Michael Weir, Robbie Winters and Derek Ferguson. PC Suzanne Hayat from Police The guests spoke about their experiences of racism and offered advice on how to deal with, and combat, racism whenever it occurs. The event was particularly significant as stewards had had to eject a Partick Thistle FC supporter from the ground at Saturday’s match against Hibs for alleged racist abuse of a Partick Thistle player. The incident is being investigated by Police Scotland.